Directions: Add all ingredients to a Boston shaker with ice and shake very well. Strain into a champagne coupe glass. 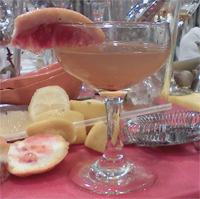 Garnish with a blood orange wedge on rim of glass. Here's a picture of it as well. I thought it was fairly tasty, something I might drink on or around Halloween perhaps, even though that wouldn't technically be winter. In any case, many thanks to Brooke for this lovely lecture on luscious libations!